If you’re looking to master your body’s incredible potential for physical movement, then bodyweight training is a must. 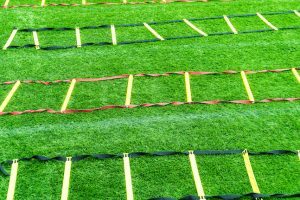 And, while you can absolutely achieve this in your own home without purchasing a single piece of equipment, there are a few apparatuses that will help you maximize the effectiveness of your training. The dip bar is one of them. 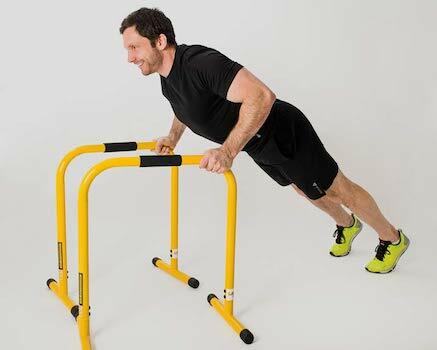 Dip bars are extremely versatile pieces of equipment that allow you to work almost all muscle groups in the upper body. With some knowledge and imagination, the range of exercises you can complete is staggering. Moreover, they’re very affordable and can be set up in almost any space around your home, inside or out. This makes a set of dip bars the perfect substitute for a good power tower for those who don’t have the extra cash or space in their home gym. Indeed, you can save a significant amount of time and money by investing in dip bars that’ll last as long as you need them. With so many dip bars on the market, however, it may prove difficult for the uninitiated to choose the ones that are right for them. 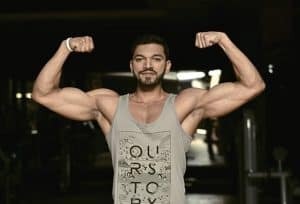 And this is where we come in: In this guide, we’ve examined the five best dip bars that you can currently pick up to take your home bodyweight workouts to the next level. Before we get into the list, let’s take a look at what makes a good dip bar. This way you’ll know exactly what to look for when making your first purchase. Like all exercise equipment, you get what you pay for with dip bars. Those in the $50 – $150 range are usually worth the asking price and will almost always outlast cheaper options. The list below features dip bars at various price points, from higher-end entries to budget-friendly options that still get the job done right. Stability is important. 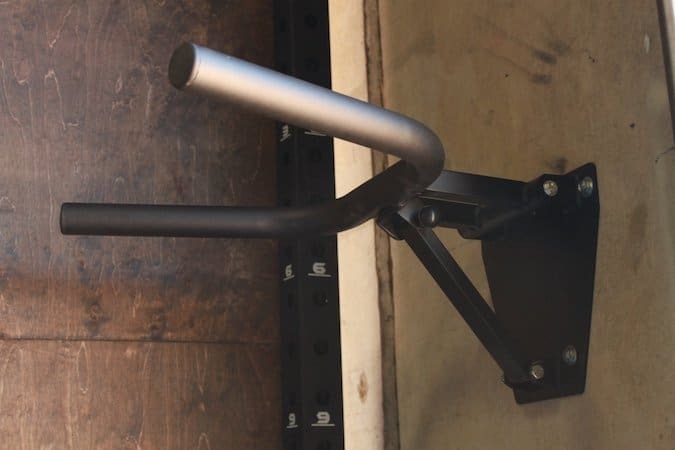 Wall-mounted bars usually offer the most solid hold. If you plan on using portable dip bars, ensure they’re attached to a sturdy base that prevents them from wobbling around. 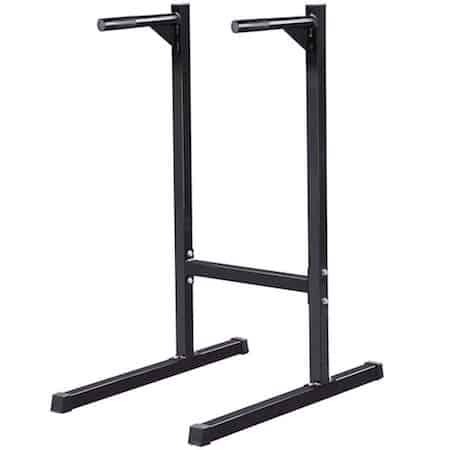 Look for bars with a high quality steel construction. The width between the bars will determine the muscle group you can most effectively work with your dip bars. 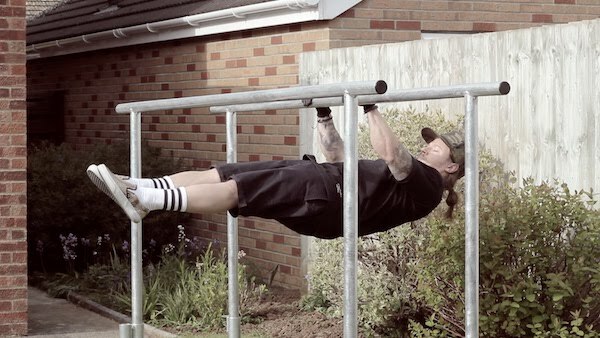 Tapered bars and some parallel bars allow for various grip widths and can therefore be used for a greater range of exercises and muscle activation. Broadly speaking, a narrow grip allows you to target your triceps and shoulders more intensely. Wider grips are better suited work the pectorals more intensely, and are better suited for building strength and size in the chest. Ensure that your dip bars come with a decent weight rating. This means considering not only your body weight, but also the additional force you apply when going through your sets. Ratings of around 500 lbs or more should be sufficient for any athlete. 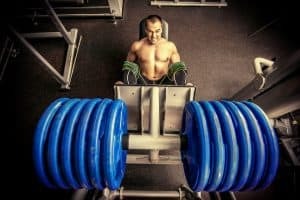 This consideration is especially important if you’re planning to use a dip belt to increase the difficulty of your dips. Finally, if your home is short on space, there are bars that can be collapsed, folded or disassembled for easy storage. Just keep durability in mind when choosing these types of dip bars. These dip bars from Fringe Sport are big on strength and small on size. They’re wall-mounted, which means they don’t take up any floor space. They can also fold up or down after use to further reduce their footprint. The benefits of their low-profile cannot be understated. 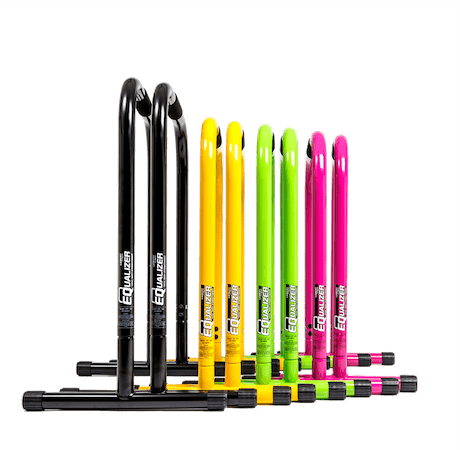 Folding them up when not in use means they don’t stick out and take up room unnecessarily, and are not eyesores in your home gym. A tapered design means you can adjust the width of your grip, thus allowing you to effectively target different muscle groups. A solid 14-gauge steel construction ensures that these dip bars is set to last – even if you manage to force up to 600 lbs of weight onto them. Despite their durable build, the Fringe Sport dip bars only weigh 25 pounds. Some assembly is required, along with the necessary mounting hardware. But once it’s set, it’s set for good. Because these aren’t wall-mounted or tapered, ProSource has incorporated adjustable height and width to maintain the same level of versatility. Height can be adjusted between 31” and 35”, while the width can be moved between 16 ¾” and 23 ¼”. This level of adjustability means athletes of all body types can take full advantage of this dip station. 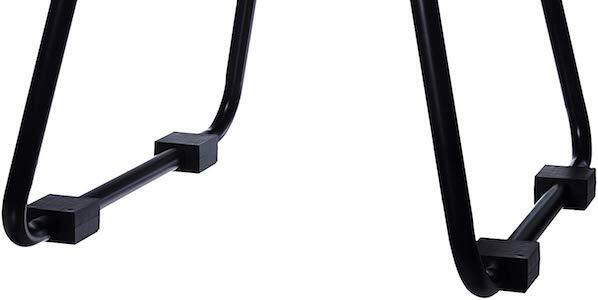 These bars weigh in at only 23.5 lbs, making them easy to move around. A weight rating of 400 lbs is made possible by the heavy duty iron tube construction. Padded grips and non-slip rubber feet ensure maximum comfort and minimal slippage. If you’re looking for unrivaled value, look no further than Lebert’s EQualizer. They’re available in a variety of colors and sizes. 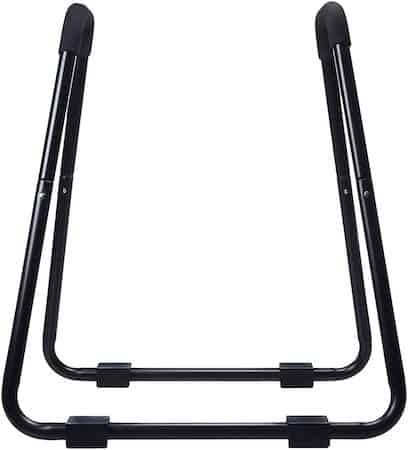 At only 8 lbs each, these bars are extremely lightweight, yet can withstand up to 400 lbs of force. Durable foam grips and a solid base ensure a stable and shake-free workout. The standard sizing option measures 28.5” in height and 25” in width. An XL version is also available that’s 3” taller while only weighing an extra 2 lbs in total. An instructional DVD with some beginner workouts is included with every purchase. Buying through Amazon also makes Prime members eligible for free shipping, adding more value to the EQualizer. Yahee Tech’s dip stand is about as solid as it gets. An iron and steel construction helps it withstand up to 500 lbs of weight. It’s freestanding with rubber feet and compact dimensions that help it remain steady in whatever little space it takes up. While not the most comfortable, the knurled handles provide a great amount of grip. This dip stand is easy to assemble and doesn’t require additional equipment. About 10 minutes is all you need to attach the rubber end caps and put everything together using the 8 included bolts. 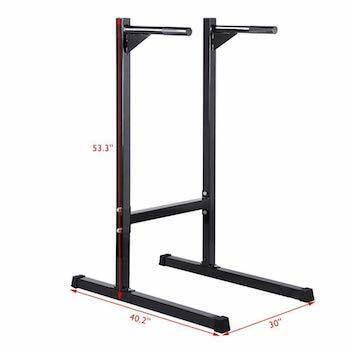 Yahee Tech’s dip stand measures in at 53.1 inches high, which is sufficient for taller athletes. 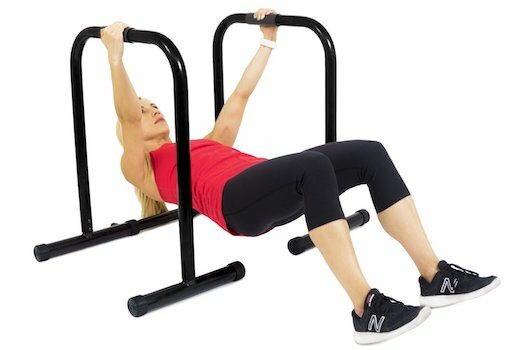 Few fitness equipment lists are complete without any entry from AmazonBasics. Like most Basics offerings, this dip bar offers exceptional value for money. Foam can be found covering the steel bars on both the grips and the base, where they serve as feet to keep you steady. A whopping 661 lb weight capacity ensures that this dip station is ready for anything. It’s easy to assemble and doesn’t require any additional equipment to set up and use. A one year AmazonBasics warranty and free Prime shipping add even more value to your purchase. Dip bars are one of the few pieces of workout equipment that allow you to target a variety of muscle groups. 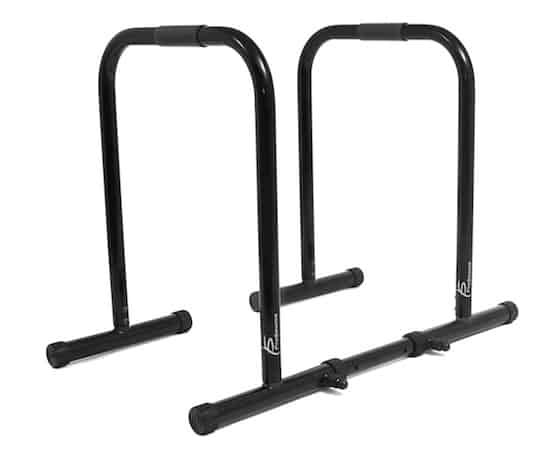 Versatile dip bars with tapered handles, or those that offer high levels of adjustability are perfect for athletes who want a single piece of equipment to work numerous parts of their body. 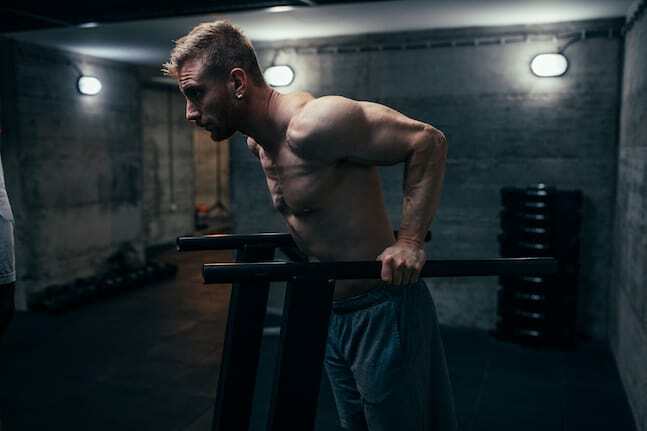 If you simply want a solution for targeting certain muscle groups such as those that benefit from dips, then a cheaper, basic dip bar will suffice. Either way, you’ll be investing in a piece of equipment that will prove highly valuable in any home gym. If you’ve decided that dip bars may not be right for you, then definitely look into a set of gymnastic rings or a suspension trainer like the Jungle Gym XT as these are also versatile pieces of bodyweight training equipment.